Despite the fact that Honda is boasting an all-new body and chassis design, you’re not going to see a whole lot of significant change on the outside. The car has been reworked to some extent, but it’s more in line with what you might see on a facelift as opposed to a generational redesign. There are some fresh goodies to talk about inside, and there is that new, turbocharged engine that promises the best fuel economy in the compact SUV class. So, without spilling the beans too much here, let’s dive on in and take a good look at the 2017 Honda CR-V. Honda CR-V On road price starts from 26,68,223/-. Check for price details of Honda CR-V in CarzPrice. Naturally, Honda has given it all to make the CR-V more viable in the premium SUV space. Slightly longer, wider and taller than the previous generation car, this new version has what it takes to be visually appealing. Firstly, there’s the crisp front-end with the all-LED headlights and fog lights that we absolutely love – they look smashing when lit. The aggressively styled headlamp units with the wing-shaped daytime running lights and the flared wheel arches give the CR-V a grand road presence. The 2018 model looks noticeably wider than the old car and that’s because of the strong shoulder line that tapers upwards towards the rear. At the back, you no longer get a split-tailgate arrangement, however, we are glad the CR-V still maintain its low loading lip. If you think it doesn’t look that good in the photos, wait until you see the new CR-V in person. It’s striking, fairly big (though not as big as ladder-frame SUVs like the Fortuner or the Endeavour) and thoroughly contemporary – and it needs to be, for its going to compete with well-established rivals. Honda has taken the interiors a notch above in this generation model. Quality of materials and the attention to detail is spot on. The wooden garnish too looks quite pleasant. The front seats offer good amount of support and feel comfortable over long drives. The middle seat is wide and also gets a recline option but under thigh support and headroom is just average, especially for tall passengers. The panoramic sunroof further eats away the headroom. Both front and middle rows over ample amount of legroom. The 3rd row is only available in the diesel variants. The petrol version misses on the third row of seats and roof mounted AC vents. This row of seats is strictly for children as there is barely any legroom to sit in comfort. Besides, when the last row of seats are upright, there is barely any luggage room in the boot. It is best to assume that the CR-V is a 5-seater with occasional 7-seater usability. On the upside, the middle and last row can be folded flat when carrying luggage is a priority. The petrol variant uses the standard stick shifter while the cabin of the diesel looks more minimalistic due to the absence of the stick shifter. The diesel variant uses shift-by-wire technology which uses buttons to select the gears. Honda has loaded the CR-V with a lot of features and driver assists. You now have a TFT Mid Meter, 7-inch touchscreen infotainment system which gets Apple Car Play and Android Auto, rear AC for the 7-seater variants, segment first electronic parking brake and brake hold, 8-way electrically adjustable driver seat, dual zone automatic climate control, remote operation of windows and sunroof, multi-angle reversing camera, keyless entry & lane watch. 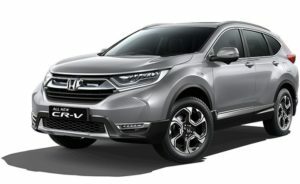 The chassis has also been reworked and, according to Honda, provides “more agile and confident handling.” Up front, the CRV is supported by a pair of MacPherson struts, while the rear is equipped with a multi-link setup with low-friction dampers. FWD and AWD models have a tubular sway bar up front and solid sway bar in the rear. This should dramatically improve the amount of body roll seen when cornering and will help to prevent oversteer if things get a little funky. Steering duties are handled by an electric power steering system.For now, performance specs aren’t available but expect the performance to be similar to the outgoing model. Zero-to-60 mph should come in about 8.8 seconds with top speed coming at around 112 mph. We’ll update you with official specs as they become available, so stay tuned. The CR-V is an urban SUV hence the steering has been tuned towards comfort. Therefore it is light at slow speeds but weighs up well at high speeds. In the city this a boon as the light steering makes manoeuvrability easy. Still this EPS doesn’t offer the feel and feedback you would like at high speeds. Body-roll is well contained and this SUV feels well planted at high speeds. The rigid chassis improves the handling characteristics at high speeds but it is not meant for corner craving. Ride quality has seen an improvement over the previous generation. The cabin is well insulated from undulating surfaces at both high and low speeds. Low speed ride is much better and the rear passengers had good things to say about the ride dynamics. The real time AWD channels power to the rear wheels when it detects low traction, else for most of the times, this SUV drives from the front wheels. The brakes render good bite and stopping power. The Honda CR-V 2018 packs a standard safety kit, which comprises six airbags, ABS, ISOFIX child seat mounts, vehicle stability assist, hill start assist, seatbelt pre-tensioners and a driver attention monitor. Tested by global safety body ASEAN NCAP, the new CR-V has been rewarded 5-star rating in the crash tests. If the all-new diesel engine/9-speed auto doesn’t appeal to you, the top-notch cabin and the sorted dynamics certainly would. The comfortable interiors and the smooth drivetrains mean the Honda CR-V is more enticing than ever. As an alternative to the Skoda Kodiaq or even the ladder-frame SUVs like the Fortuner and the Endeavour, it is an intriguing proposition, one that ticks a lot of right boxes. The much awaited diesel power will certainly help the CR-V appeal to a larger chunk of audience. If priced right, this 2018 model has the potential to cease the dry sales run and perhaps finally attain the numbers the CR-V has always deserved. We expect it to be priced between Rs 34-38 lakhs to take on the likes of Skoda Kodiaq, Toyota Fortuner and the Ford Endeavour.